When a court formally nullifies a marriage or domestic partnership, the court is essentially stating that the marriage or domestic partnership never legally existed. Thus, the parties to an annulment do not share the same rights and obligations as couples who file for a divorce or legal separation. Since under an annulment no marriage or domestic partnership existed, there is no parentage or paternity. Thus, either party must ask the family court judge to establish parentage for any children the couple may have had together. Once parentage is established, the judge can make court orders relating to custody, visitation, and child support. Since no marriage or domestic partnership existed under an annulment, community property laws do not apply to property and debts acquired during the invalid marriage or domestic partnership. Under California’s community property laws, any property acquired during marriage or domestic partnership is community property. When a marriage or domestic partnership ends in a divorce, all community property assets and debts must be equally divided between the spouses. However, under an annulment, there was no valid marriage or domestic partnership and as a result, there was no community property acquired. Thus, once an annulment is finalized, the parties have no right to equal distribution of the marital property. Under California Family Code Section 2251, if a party to an invalid marriage or domestic partnership honestly believed the marriage or domestic partnership was valid and had no reason to believe any deficiencies existed, the party may have “putative” spouse or domestic partner status. When a party attains a putative spouse status, the party may have a right to community property, support, and other property-related benefits. To establish a putative spouse status, the party must prove that he or she had a “good faith” belief that the marriage or domestic partnership was legal under California law. Don’t go through a divorce alone. Call the family law attorneys at Wallin & Klarich today. If you are contemplating getting an annulment or a divorce, it is important that you have an experienced divorce attorney to guide you through each option. The skilled Wallin & Klarich family law attorneys can help you decide which option would better suit your situation. 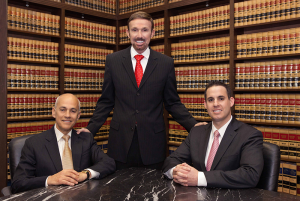 The annulment attorneys from Wallin & Klarich have dealt with annulments for over 30 years. With offices located in Los Angeles, Orange, Riverside, San Bernardino, San Diego, Victorville, West Covina, Sherman Oaks, Torrance and Ventura , there is a Wallin & Klarich attorney available wherever you happen to live.